The history of the Watermelon Festival – USWSESSC Inc. 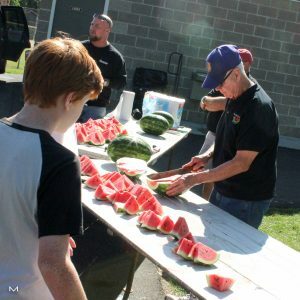 This is a brief history of the U. S. Watermelon Speed-Eating and Seed-Spitting Championships, Inc. that have been held annually since 1968 in Pardeeville, Wisconsin. These Watermelon Games were begun one evening after a meeting of the Pardeeville Businessmen’s Association. They were having an after-meeting “social hour” at Bob Merwin’s Long Branch Saloon. Present were R. H. “Hoot” Thompson, Ray Bankers, Bob Merwin, Bob Williams, Merwin Smith, Herb Kampen, Ken Gavinski and a few others. Talk began with a general discussion of having an event to put Pardeeville “on the map”. This was to be a full-filled day, cheap and easy for the sponsors and relatively free of cost for those who attended. They talked, and drank, and laughed, and the outcome of the evening was five weeks later when the first Watermelon Festival was held. The first Spitting event was held on the old cement platform next to Frog Pong in Chandler Park. The first Eating Contest was held on the tennis courts. The second year, these two events changed locations and have been held at their respective sites until a few years ago. The first coordinators of the events were “Hoot” Thompson and his son Steve in seed-spitting, and Bob Williams and David Fitzgerald in the speed-eating events. Over the years, new events have been added such as Largest Watermelon contest, open to all local growers. 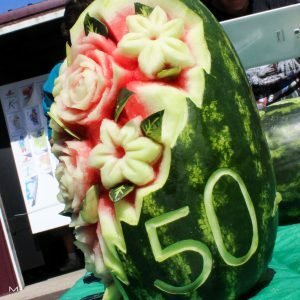 There is a Watermelon Carving Contest as well where competitors use their skills to create works of art.